Rubbabu Aniwheelies are much smaller than the original Large Rubbabu Animals, but the look and feel is the same. They are pretty average size when compared to other toy vehicles, and are perfect for little hands. 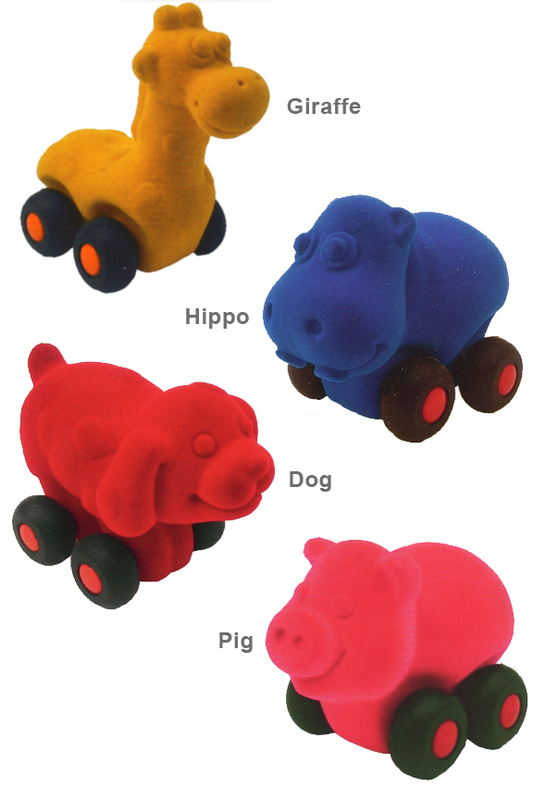 These small, animal-shaped cars are made from natural rubber so they are squishy, nicely bouncy and nearly impossible to break or ruin. The rubbery body is completely covered with a velvety soft flocking that is made from nylon. This gives them a vibrant look and a texture that children love. Because of the material they are made from, these toys are fun to play with, easy to grip, and they bounce instead of break when they are thrown or tossed. 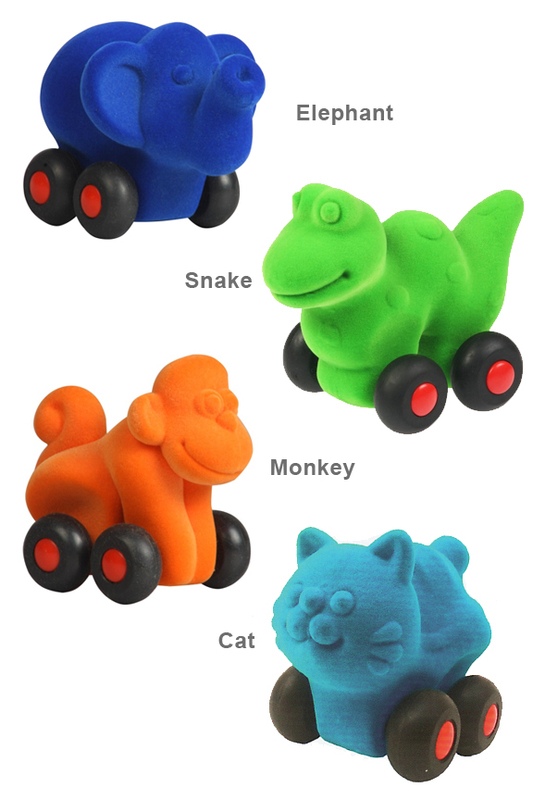 Attention to detail, and several fun animal shapes make Rubbabu Aniwheelies a great alternative to traditional toy cars or animal figurines. The Rubbabu line of toys is one that you have to feel to truly appreciate. Rubbabu Aniwheelies offer endless hours of enjoyment and tactile stimulation. They are super colorful, and made entirely of 100% biodegradable, all-natural rubber along with a soft and safe nylon coating. Rubbabu are smooth to the touch, and they really squish when squeezed, yet they are sturdy enough to handle years of abuse because of the tough rubber construction. This means that your kids won't be able to wear them out quickly, and you won't cry in pain if one is stepped on due to being left in the middle of the floor. Looking for a larger animal? click here. If you would prefer a more traditional car, click here for the regular Rubbabu Vehicles. These toy vehicles are sure to please. Safe and natural materials ensure a high quality car that children will play with for years to come. They are equally enjoyed by children as young as two, as well as the older ones.The bright colors, amazing details, soft texture, and squishy bodies make these animal vehicles truly unique. Kids love to roll them all over and the look and feel will have them coming back time and time again. The exterior of the toy is covered in safe and non-toxic flocking that makes it feel silky smooth to the touch. Your child won't want to put it down, guaranteeing hours of tactile amusement. When tossed, they just bounce and keep going! These squishy animals will take a large amount of abuse, and are designed to last for years. Your children will have a ball while strengthening motor skills and coordination. There are no batteries or remotes involved in this toy, but despite the simplicity, they are incredibly versatile, educational and engaging to young ones. They are specifically designed to stimulate the senses and facilitate the development of fine motor skills and hand eye coordination. 100% biodegradable and tested safe. Rubbabu is made with natural rubber instead of the synthetic stuff used by other manufacturers. It comes from the sap of the tree, so nothing is cut down or destroyed to extract it, and the material is completely renewable. Other rubber products will contain fillers that lower the quality and make the rubber less sturdy. With Rubbabu, there are never any fillers, so you get a stronger, more durable rubber toy that will last for a long time. Another benefit beyond flexibility and strength is that this natural rubber is anti-microbial, dust mite resistant, mildew resistant, hypoallergenic and flame retardant. You can feel good about purchasing a toy made from renewable resources, and even better knowing that your children will be safe when they play with it. With Rubbabu even the manufacturing process is eco-friendly because only a very small amount of electricity is needed to produce each one. Twelve styles to choose from. Order Yours Today! Dimensions 4" x 2.5" x 3.5"
Color Varies - (Red, pink, orange, yellow, light blue, dark blue, light green, dark green) PLEASE NOTE: Vehicles may come in different colors than shown. If you want a certain style AND a certain color, please indicate in the comments section at checkout, or call to place your order over the phone. Uses Roll them around, bounce them off jumps, squeeze them while crawling, your kids will find all sorts of ways to play with these versatile vehicles. The soft exterior and squish-ability keep kids coming back for more. Animal-shaped vehicles made from natural foam rubber. No batteries, plugs or remotes. Just plain fun! Aniwheelies are a favorite of boys and girls alike. Order Yours Today! These are perfect for a little guy who is too young for metal cars yet. Is this the whole set we are getting if we order? No. It is your choice of one.